The Biology Leadership Conference’s (BLC) keynote speaker this year was Nancy Hopkins. She gave a riveting talk that stopped everyone there in their tracks – and I’ve been thinking about it ever since. She started off with 15 minutes or so describing her research. Dr. Hopkins, for those who don’t know her work, is a molecular biologist at the Massachusetts Institute of Technology. She is known for her work identifying the genes required for zebrafish development. With the students in her lab, she has developed an efficient method for large-scale insertional mutagenesis, which allows large scale genetic screening to identify and clone 25% of the genes essential for a fertilized egg to develop into a zebrafish larva. A chance observation led to the discovery that one class of the genes they were tracking predisposed the fish to cancer. 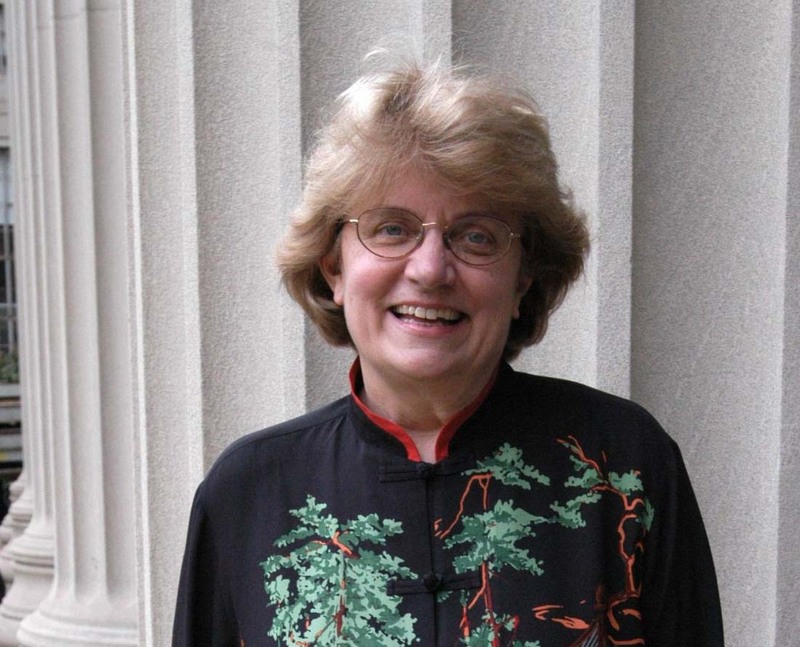 The quality and impact of Dr. Hopkins’ work lead to her induction into the American Academy of Arts and Sciences, the Institute of Medicine, and the National Academy of Sciences. But that’s not all she’s known for. From 1995-97, Dr. Hopkins chaired a committee at MIT that studied inequalities experienced by women science and math faculty as a result of unconscious gender bias. The summary report from that committee – known as the Report on Women Faculty in Science at MIT – is credited with launching a national re-examination of equity for women scientists. In January 2005, at an NBER meeting in Cambridge, MA on the topic of how to address the under-representation of women and minorities in science, technology, engineering and math (STEM) fields, Dr. Hopkins rather famously walked out in protest during a talk given by then-Harvard University President, Larry Summers. In his address, Summers proposed that one reason for the very small number of high achieving women in science and engineering fields might be their lesser “intrinsic aptitude” for these subjects, relative to men. Subsequent news articles and reports about Summer’s speech set off a national discussion on gender discrimination, which ultimately was one factor leading to Summers’ resignation as the President of Harvard. A review of the literature on women’s intrinsic scientific abilities, published by the National Academy of Sciences, in response to this debate, found no evidence to support Summers’ hypothesis. Dr. Hopkins explained all of this to us, during her talk, and then went on to describe the impact of this insidious gender bias on women scientists – limitations on lab space, resources, funding, promotion, lower pay scales, fewer teaching assistants, and higher requirements to achieve tenure relative to men. You might at first be tempted to think that gender bias like this is bound to be worse at MIT – a bastion of male-ness if there ever was one. But Nancy explained that, since the report’s publication, she’s received thousands of letters of support from fellow faculty at colleges and universities all over the world. At the conclusion of her talk, I heard many women in the audience sharing grizzly tales of their own discrimination during graduate school and afterwards. One thing that struck me in listening to their stories, and reflecting on my own, was the fact that small events matter. Many of the women I spoke with at the conference relayed experiences that, if taken in isolation, might have been brookable. But it was the accumulation of these events – the accumulation of disadvantage – that added up to the overall damaging picture. It also occurred to me that this mosaic pattern of disadvantage (many small events contributing to a large picture) that might be one reason why women find it difficult to fight back or fail to formally register grievances. Nancy pointed out, in her talk, that it’s also much easier to live in denial (e.g. there must be some other issue at work here) than it is to directly confront the sheer injustice of it all. Did the situation at MIT improve after the report was published? Certainly it did, explained Nancy. The current President of MIT is a woman (Susan Hockfield), two of the five academic deans are women, there is a large day care center on the center of campus, and she notes a larger capacity, in general, to talk about and address the problem. And yet. The numbers of women faculty in STEM fields is still low, relative to the general population. Dr. Hopkins explained that although there has been an increase in the number of women earning PhDs, there is a lag in the number of women achieving tenure and getting to the highest levels of leadership in research and administration. The pipeline, Dr Hopkins explained, is leaky. It is that insidious gender bias that is, in part, responsible for that leaky pipeline. I say “insidious” because, for the most part, it is unconscious gender bias – hidden even from oneself. 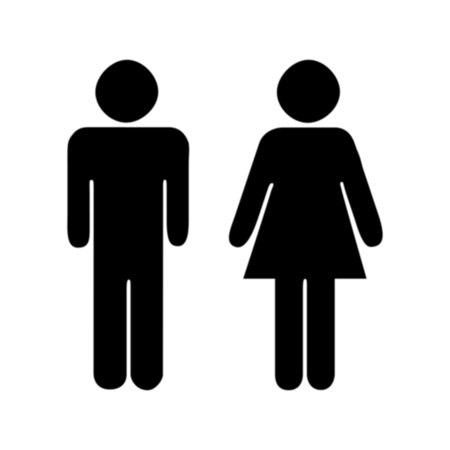 We may well think that we treat men and women equally but cognitive psychologists know better. Nancy cited studies of blind orchestra auditions and peer reviewed scientific papers that show, when those in the position of judgment know the gender of the individual, they make different decisions than when they do not. People may believe that they are making an evaluation based solely on merit, but our perceptions are influenced by our biases. And we all have them – men and women alike. But what’s to be done about this? Certainly awareness is the first big step in the right direction. If we “out” our hidden biases, perhaps we have a shot at combating them? And with that idea ringing in my head, I decided to take one of the online tests offered by Project Implicit (a virtual research laboratory for the behavioral sciences, jointly run by Harvard University, University of Virginia, and the University of Washington). The online test, which takes 10-minutes to complete, reveals our hidden (implicit) biases. 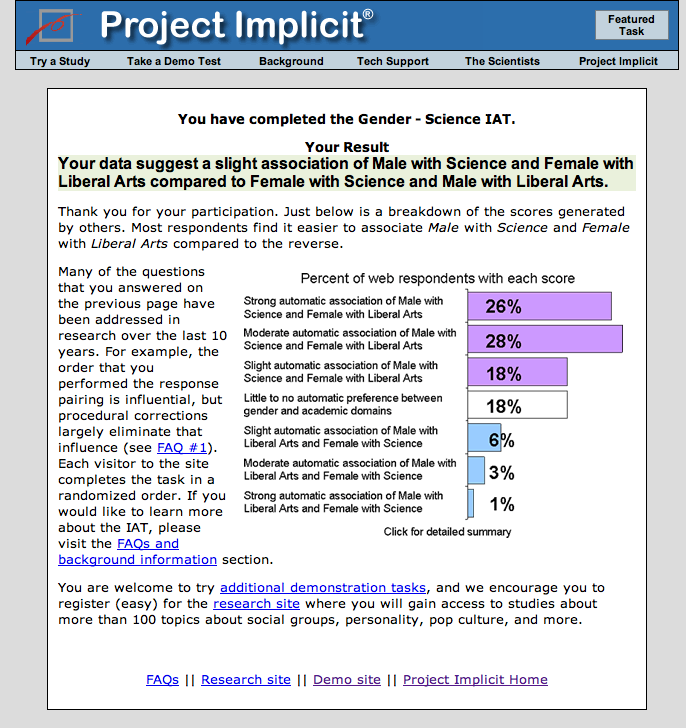 There are a number of instruments on the site; I took the one that reveals the relative link between liberal arts and females versus males and science – The Gender-Science IAT. As an ardent feminist, I was pretty sure of myself going into this experience. So you can imagine my surprise when my results (pictured above) showed a “slight automatic association of male with science and female with liberal art”. Gulp. I took some comfort in noting how my results compared to the thousands of other people who have taken the test until I realized that, wow, this data shows that a full 54% of the test-takers have a moderate or a strong association of males with science and females with liberal arts. How revealing is that? OK, so if we know about our implicit gender bias, what do we do about it? Nancy Hopkins was struck by the power of the people in the room at the BLC. While she’s given a similar talk to many audiences all over the world, she’d never attended a gathering like this. Assembled in the room were 70 college biology instructors who regularly touch thousands of undergraduate science students. It doesn’t take much imagination to realize the impact that these professors could have on their newly-arrived freshman science students – males and females. But what, specifically, could they do to combat these underlying and often hidden biases? Fortunately, Nancy had some suggestions. She recommended the work of and the book, Why So Slow, by Virginia Valian at Hunter College – CUNY. I immediately looked Dr. Valian up on line and found these extremely helpful tutorials. The first three clearly and succinctly lay out the issues, supported with data and references. Dr. Valian talks about gender schemas – that is, hypotheses about what it means to be male or female. Hypotheses that influence our behaviors and the way we think. Hypotheses that we all share. So these schemas assign different psychological traits to males and females. For example – women are nurturing, expressive, and behave communally. Men are capable of independent action, oriented to the task at hand, and do things for a reason. In brief, men act; women feel and express their feeling. These schemas come from the culture we live in – we adjust our behavior according to our culture’s norms and expectations. The fourth tutorial concentrates on remedies and solutions. For instance, Valian talks about the ways that legitimization from a credible source can reduce gender bias in the case of teaching assistants or lab staff. She suggests orientation sessions for first year science undergraduates to give them the heads-up on the ways that gender and race can influence. She encourages the development of departmental procedures that will not disadvantage females they think well of (for instance, in writing letters of recommendation). She talks about the importance of being aware of who is “cognitively available” to you – who comes to mind when thinking about invitations to give talks, to sit on a review panel, to become part of a grant proposal, to be a colloquia speaker, to chair a committee? Keep track of the markers of success and stop inadvertently giving advantage to men over women. Good intentions are not enough – have a policy, keep track, and work to have an appropriate range of sexes and ethnicities. And finally – to connect Mary Deane Sorcinelli’s BLC talk to Nancy Hopkins’ – Dr. Valian’s tutorial recommends devising your own personal “board of advisors”. Valian explains that she prefers that phrase to the more often used term “mentor” because, as she puts it, “no single person can do it all”. Sound familiar? People need multiple mentors – or mosaic mentors – that are called upon for the various needs you encounter on your career trajectory. As your goals and needs change, your advisors change – you are in the driver’s seat and you determine what advice and support you need. p.s. And just this last weekend – an article in the NYTimes – Bias Called Persistent Hurdle for Women in Sciences, describing a report to be released this week by the American Association of University Women entitled, Why So Few. Stay tuned. p.p.s Check out the letters, written into the NYTimes, on the heels of that article, from women all over the country.